A Visit to Maddocks Mill and Hart Ford? 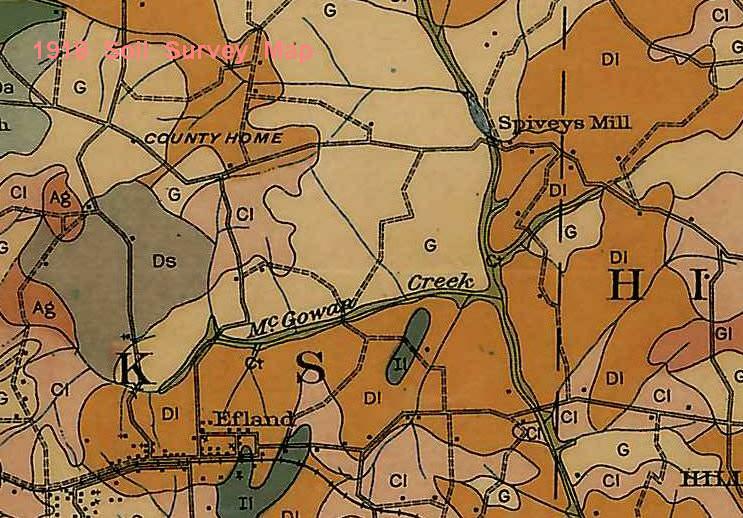 [Click any of the images to see an enlarged version] "Old Mattocks Mill", the site where Regulators planned the plans that went awry and led to the Battle of Alamance is just west-northwest of Hillsborough, NC near the confluence of McGowans Creek and the Eno River, on the southwest corner of that intersection. 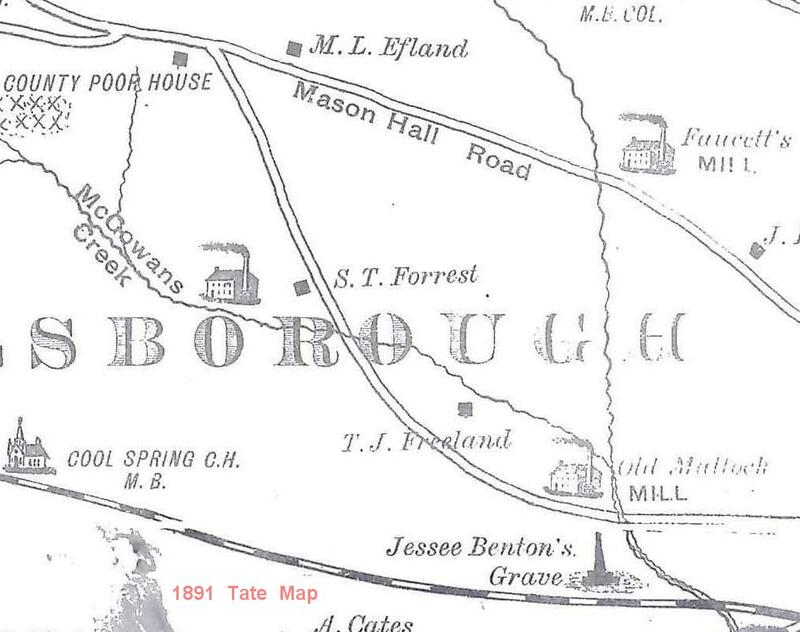 It is likely that the dam powering the mill crossed the Eno a few yards downstream from the confluence and, depending on the length of the head race, that would put the mill a few yards plus some below the confluence. 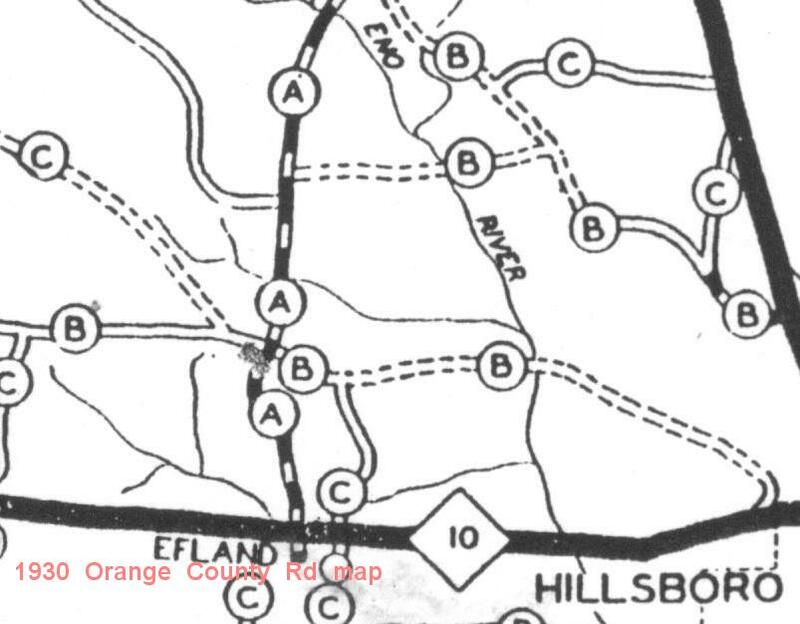 The site is now under "Corporation Lake", an Orange-Alamance water source, and invisible. A worker at the nearby water processing plant said that during low water the dam can be seen in the lake bottom. It is said that the lake is almost completely silted up so, if they ever dredge the silt out of the lake, maybe we'll get a more precise location and a chance to map this important historic site. Because Regulator meetings occurred at his mill, to save his neck the owner, Joseph Mattock, gave the mill site to then Governor Wm Tryon. Tryon in turn gave it to one of his local loyal supporter, Thomas Hart. Mattock then led the Quakers of Eno Meeting (i including President Carter's ancestors) to Georgia. Some will recall that Hart and Benton both were involved with Judge Richard Henderson in the questionable purchase of Cherokee lands during the time of the Regulation. Henderson, Hart and Benton also played leading roles in the anti-Regulator movement in support of Governor Tryon's clique. Jesse even spent some time as the Governor's private secretary when he assume governorship of New York, but quickly returned to Carolina before the Revolutionary war. In fact, according to one of his scions, the noted polymath from UNC, Archibald Henderson, Judge Henderson may have aided the suppression of the Regulators so as to encourage Regulators to move west to lands purchased by the Judge, the Harts, Benton and others in modernKentucky and Tennessee. With the governor's gift to Thomas Hart, Mattocks Mill became Harts Mill, and the area around it became Hartford. Hart, a visionary along the lines of Judge Henderson, envisaged a planned community at Hartford, and he applied to the colony for the first college charter in North Carolina. The charter was granted for Hartford Academy and a headmaster hired. The doors opened in 1776. The headmaster was a Tory, and Hart himself was at best a lukewarm patriot, so the academy immediately closed. Hart moved to Maryland, apparently a healthier climate for Americans unenthusiastic about the revolution. He left the mill in the hands of Jesse Benton, his son-in-law and subordinate in various business ventures. Jesse, the father of Thomas Hart Benton, died trying to make a go of the mill complex. The painter, Thomas Hart Benton, famous for his New Deal murals and oils celebrating the noble folk of the great plains and mines was a grand nephew of some degree to the original of that name. While he camped at Hillsborough, Revolutionary W ar General Cornwallis lost a detachment of twenty-some troops sent to grind meal and guard the Hart/Benton mill. A militia band led by Captain Joseph Graham attacked the mill and destroyed both the mill and British picket. This probably convinced the British that Hillsborough wasn't nearly the safe resort they had hoped it would be and they left for friendlier parts and more functional mills soon thereafter. In the vicinity of the old mill can be seen roadbeds that once led to the mill, at least one house site that may or may not relate to the mill (only archaeological testing will tell). Yet to be found and mapped are a ford and other remainders from these long ago days. The stone outcrops mentioned by Captain Graham may yet be found too. Notes on the parties mentioned: Thomas Hart moved from Maryland to Kentucky, on to some of the land given to the Transylvania Company in recompense for its legally dubious settlement in the area of that state. He became a community leader and expired in good grace, his lack of Revolutionary fervor and his abuse of Regulators apparently were no bar to forgiveness. Jess Benton, as noted, died at Hartford. Thomas Hart Benton at about age 17 went to UNC. He was caught stealing from his classmates, disgraced and ejected from the school. He moved to Tennesssee with his mother and siblings perhaps to escape the shame, perhaps to simply capitalize on the few crumbs of land unclaimed by his fathers creditors. He and his brothers fought what some called a duel but what really sounds like a simple gunfight with Andrew Jackson's gang, and seriously wounded Ol' Hickory. The Bentons then relocated to Missouri (Daniel Boone's final settling place) where Thomas became a US Senator and served with and cooperated with Jackson. The British troops killed and captured at Harts Mill and Graham's militiamen who killed and captured them were finally commemorated with a history-on-a-stick plaque near the battle site, on Highway 70 just west of Hillsborough, NC and the Eno. We'll keep looking for artifacts of this fascinating little piece of American history.